Installation view of Pile the Wood High (Anna Helm, Lisa Lapinski, and Hirsch Perlman). Moody Center for the Arts at Rice University, 2018. 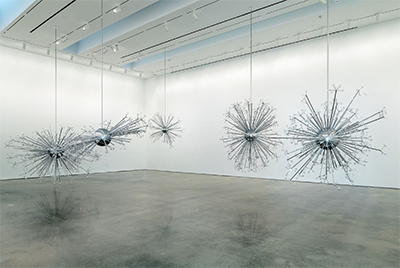 Installation view of Island Universe by Josiah McElheny, 2008. Chrome plated aluminum, handblown and molded glass, electric lighting, and rigging. Dimensions variable. Moody Center for the Arts at Rice University, 2018. Courtesy the artist. Photo: Nash Baker. 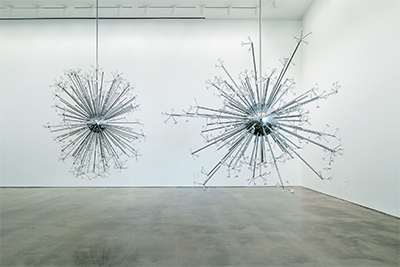 The artist, Josiah McElheny, working with cosmologist David Weinberg, creates a gallery-sized installation, consisting of five hanging chromed-metal, transparent hand-blown glass and light sculptures. He titles it Island Universe, as a visual representation of a multiverse scenario of the Big Bang Theory. Later, poet Joseph Campana, reads new work inspired by the art and then converses with astronomer Dr. Christopher Johns-Krull about the science behind the installation. On another night, KINETIC, a conductor-less ensemble of string musicians, performs select pieces by John Adams, Arvo Pärt, and Erkki-Sven Tüür amid, and in celebration of, the sculpture. Yep, it’s just another typical (a.k.a extraordinary) night at Rice University’s Moody Center for the Arts. A little over a year ago when Rice University officially opened the large, sunlight-streaming glass doors of the 50,000-square-foot, $30 million facility, it quickly became apparent that the “something new” meant a chance for students, faculty, visiting artists and the entire city of Houston to explore, experiment, and create outside their familiar zones. Cross-, multi-, and interdisciplinary projects might be all the rage in the arts, sciences and business fields, but the Moody Center, which contains classrooms, workshops, galleries, a black box theater and even a cafe, takes that cross-disciplinary trend and makes it the guiding mission. On the occasion of the one year anniversary of the Moody, Weaver recently sat down with me to do a little look back and into the future. Our talk often wandered into the nature and creative rewards of conversing itself, especially when exchanging ideas across one’s chosen area of knowledge. While Weaver thinks and describes the Moody as a “hub” or “hinge that swings both across campus and the community,” we might also think of the Center as a kind of bridge between Rice and Houston–perhaps even the state of Texas and beyond–and between the different departments and disciplines of the University. Moody houses no one department, and Rice students from any discipline can take classes there. 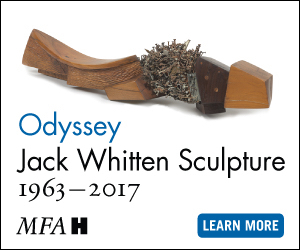 At the same time most of Moody’s programming, the art exhibitions, performing arts events, talks and concerts are open to the public and much of it is free. “We’re accessing the intellectual capital of the university, making it more available to the public, but we’re also bringing the public and their creative expertise to Rice,” describes Weaver, noting everyone benefits from such exchanges. “One thing I find is that students at Rice don’t have a chance to meet people who work in the arts. They meet engineers, lawyers, the Houston working community, but they don’t often meet people who actually make a living in the arts,” she says, but also observes that this isn’t just a limitation of those in academia, that many people keep mostly to their chosen field and interests after college. Getting people from different disciplines to talk and respond to each other can lead to creativity and innovation. software. 13ft x 17ft 1/2in x 15ft. 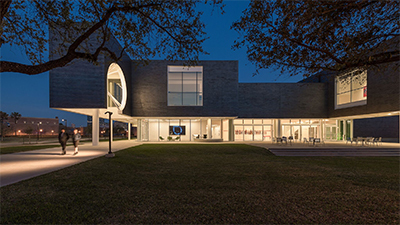 Moody Center for the Arts at Rice University, 2018. © Leo Villareal. Courtesy Pace Gallery. Photo: Nash Baker. 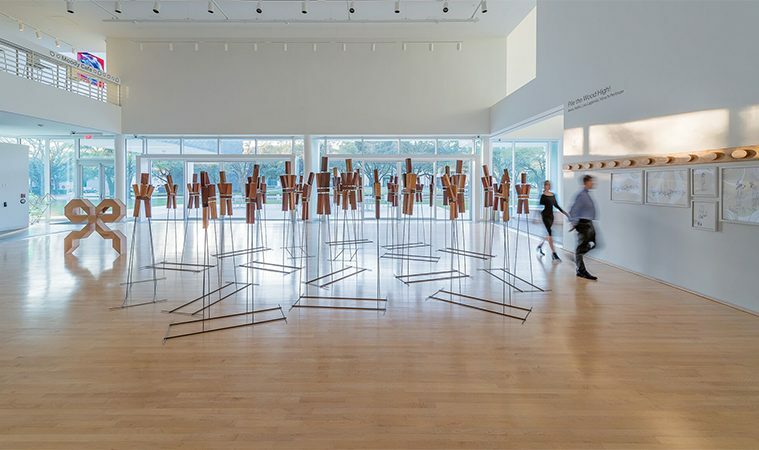 Many of the art exhibitions and performances the Center presents begin as art inspired by other subject matter;from that work, Weaver and Moody programmers cross the disciplinary streams to create dialog and response. Island Universe certainly hangs–from the ceiling of the Brown Foundation Gallery through June 2–as a good example of the Center’s practice of “fostering conversations.” Besides the talk with Johns-Krull and poetry reading by Campana on April 9, McElheny delivered the Rice’s School of Humanities Campbell Lecture Series in March. 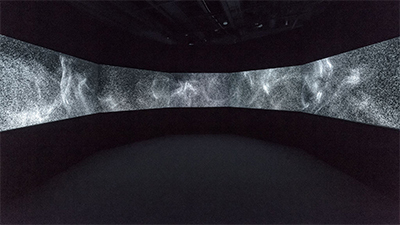 Not to be outdone, the other main art exhibition at the Moody this spring, Leo Villareal’s Particle Chamber (on view now until the Dec. 31, 2018) an immersive installation inside the Media Arts Gallery that plays with light, space, technology, and sensory perception, will bring the artist back to Rice on April 6 for a dialog with Dr. Marcia O’Malley, Rice professor of Mechanical Engineering and Computer Science, an expert on robotic development. “What I look for when programming are projects that have meaningful intersections with other fields, that have the potential to spark thought and conversations across disciplines,” says Weaver. When bringing in performing arts projects and hosting events, she also employs that same kind of create-and-respond programming philosophy. DADA GERT (May 11-19), an immersive work of dance theater from choreographer Annie Arnoult and Open Dance Project, doesn’t have a science component as inspiration; instead, Arnoult, who Weaver describes as very much a “research-based” artist, will create a dance referencing history, especially that of Berlin during the Weimar Republic. “To me that’s a very interdisciplinary process. We’re going to have a consortium of scholars who study the Weimar era, scholars who span philosophy, visual art, history and literature, all of whom care about the Dada period between the wars. We’re going to bring them together and have a conversation with Annie,” describes Weaver. Of course bringing together artists and historians, scientists, engineers and business people isn’t the end of the programming. Encouraging Rice students and curious, thoughtful Houstonians to come and listen and sometimes participate lies at the core of the Moody’s mission. A year into their existence, Weaver might only have anecdotal evidence, but she does see sparks beginning to ignite. 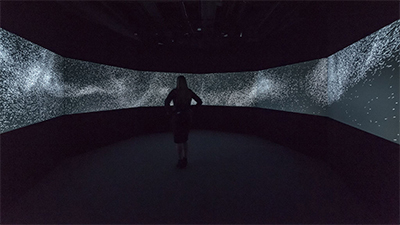 She remembers in particular audience reactions to a conversation between artist Diana Thater, whose video installation Starry Messenger hung in the reception gallery in 2017, and Rice professor Dr. David Alexander, an expert in solar astrophysics. And perhaps from that intellectual and sometimes emotional stimulation, ideas form and thinking expands. © Moody Center for the Arts at Rice University, 2018. Photo: Nash Baker. Weaver herself in some ways represents that cross-disciplinary dialog. With a background in art history and an MBA, she sees the Moody from different perspectives, especially now as they move into their second year and continue to integrate into the Rice and Houston communities. The Moody Center itself began and remains something of an experiment itself, the first of its kind, so keeping that creative, inventive spirit in programming and education seems intrinsic to who they are.